It's crazy, I haven't posted since October :( Life has been filled with schoolwork, and I've been super busy with a new school and a lot of new friends. For a while, I wasn't really feeling nail art, either -- it just seemed so much less important than going to grab food with friends or getting a head start on my American Studies essay. But I've come to miss it, so here I am with a super quick design. The story behind these is kinda funny. I ordered a dress for our school's winter semiformal dance, but it didn't come in time (SMH @ Tobi) so I ended up running around trying to find another dress to wear. I ended up borrowing one from a dear friend, but at that point I had like thirty minutes to get ready and I still had to do my nails. 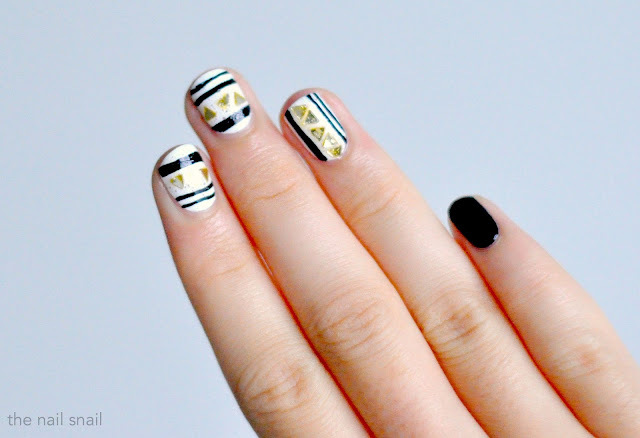 Most nail art is super time-intensive, but I managed to do this design in about 15 minutes. It's super simple, just a black background and some gold dry brushing! Quick, but elegant. I promise I will try to post more often -- I hope you guys are doing well! 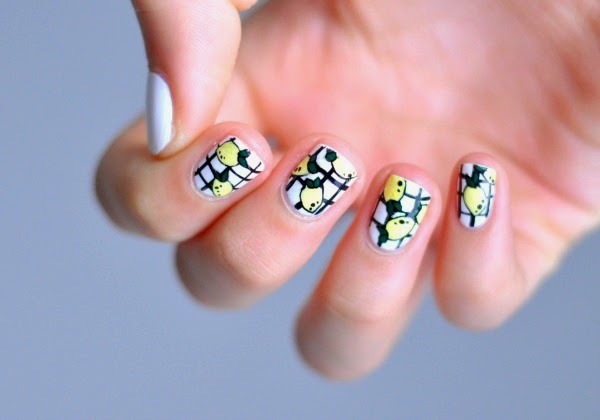 I'll probably be creeping on your blogs shortly to catch up with the nail art world. 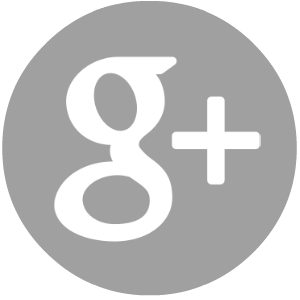 I feel like I just published a post, time is going so fast. I'm trying to get back into the habit of doing nail art most weekends though! This weekend I did a simple little cactus design. I feel really bad about not posting more and I'm gonna try to post more regularly for the rest of this school year at least! It's August, but where I live it's still SO hot! 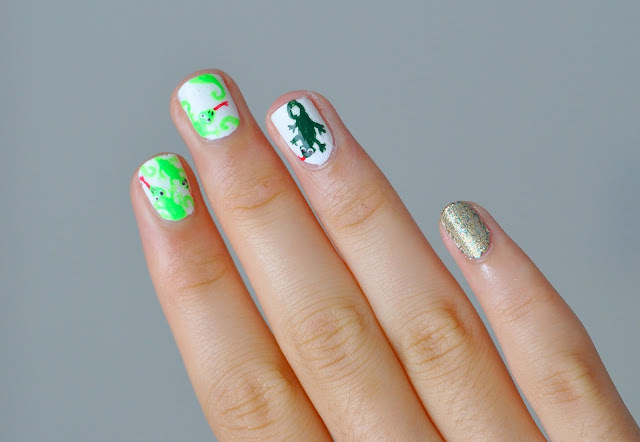 Of course, I was inspired to do some hot nail art. I used the dry-brush technique to do the background, then used a small detailing brush to paint the plants. I love painting long nails, but I hate the feeling of having long nails :( Do any of you guys feel the same way?? I had a lot of free time today so of course I decided to do my nails! I don't remember how I came up with the idea of doing lizards, but my first reaction was that it would be insanely hard. I decided to give it a try anyways and it actually wasn't hard at all! I also made a tutorial! I hope your summers are amazing! I've been sleeping in until noon every day and lazing around the house, hahaha. 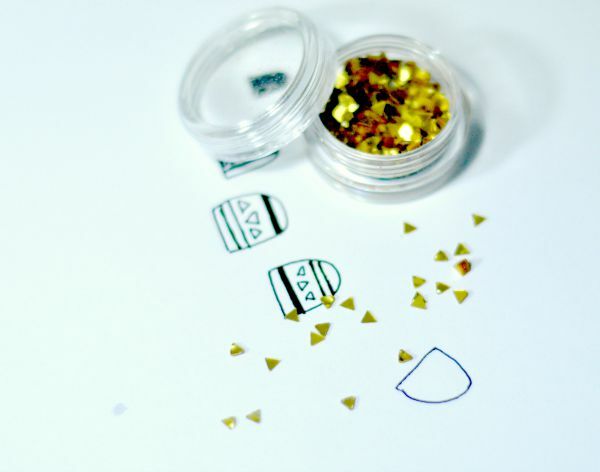 A representative from the Born Pretty Store recently (or, not so recently -- oops) contacted me and asked me to review a product for them, and I chose the gold triangle studs! I decided to do a sort of tribal print design thing with them. I used a thin brush to paint the lines and placed the studs with a pair of curved tweezers. Before top coat, it looked great! Unfortunately, the top coat bubbled and the gold color of the studs smeared when I added my cheap 99-cent NY Colors clear coat. I'm not sure if this is an issue with the studs, or with my clear coat. Overall, I liked the studs. The only reservation I have is that the gold color smeared. They were exactly what I expected, and for $1.27 for an entire pot of studs it's very cost-effective! 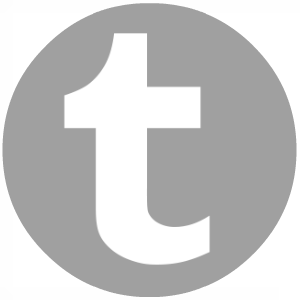 I hope I'll be able to post more regularly, and even if I can't I'll definitely check out y'all's blogs! P.S. 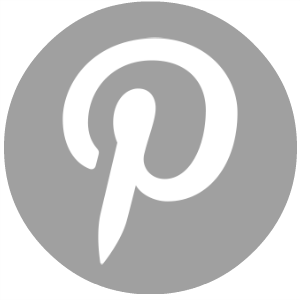 You can use the code CYNW10 to get 10% off regular priced items at the Born Pretty Store! 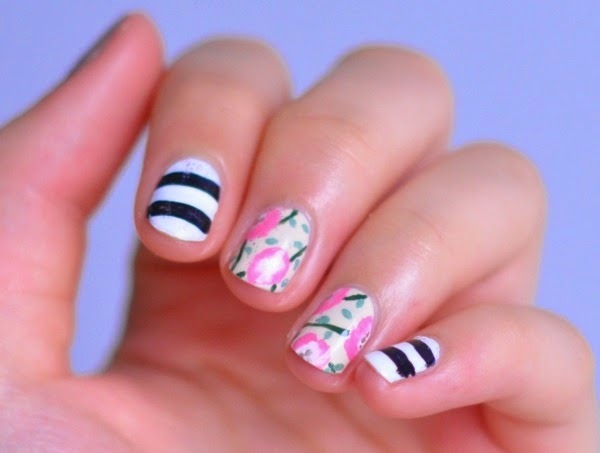 Stripes and flowers are always a classic combination. And the one stroke technique is a lot of fun. If you've never tried it, you're missing out!! In other news, I recently found out that I was accepted into a top-flight boarding school for science and math. It's an amazing opportunity and I've decided to attend next year, but that means I'll be living in a dorm and I'm not sure what that's going to mean in terms of nail art. I will definitely try to keep the blog running, but it might not be possible -- we'll see! 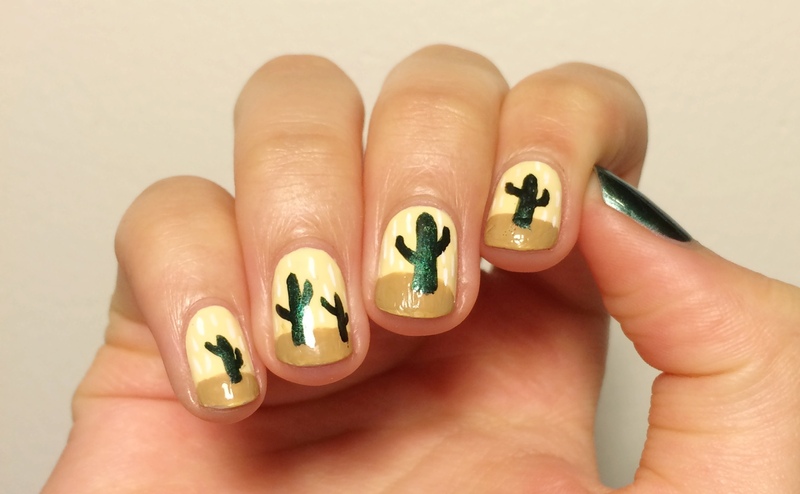 If any of you guys live in dorms, are you able to do nail art? 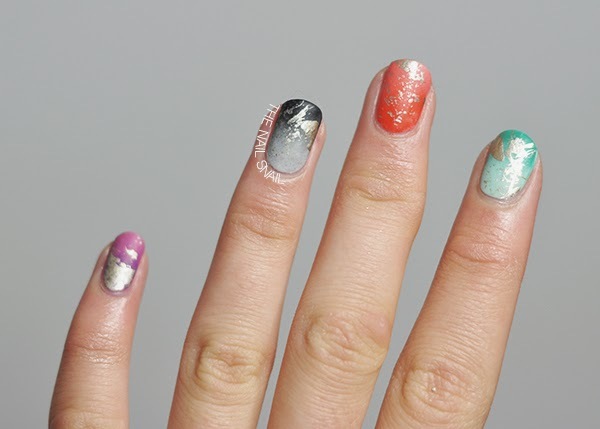 I feel like I would annoy people with the smells of acetone and nail polish and stuff. 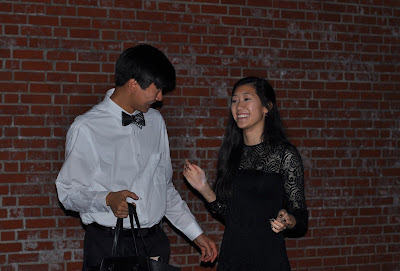 It's about time for fresh stuff on the blog! 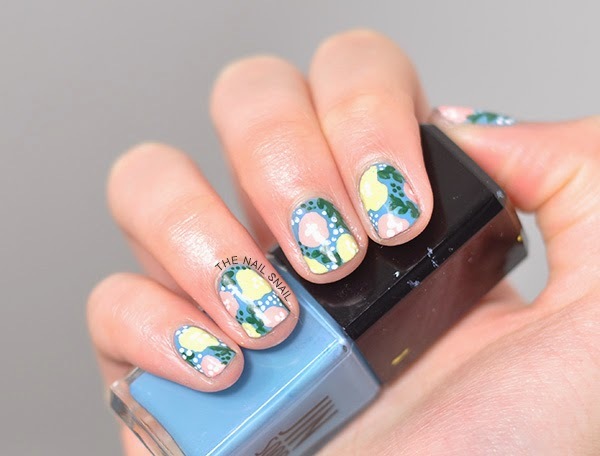 Today I have some fun lemon grid nail art and a even a video tutorial to go with it! And the tutorial!! (my first video tutorial ever!!) If you guys wanna like and subscribe, that would be cool! Hope you guys like this fun design, thank you for reading!! 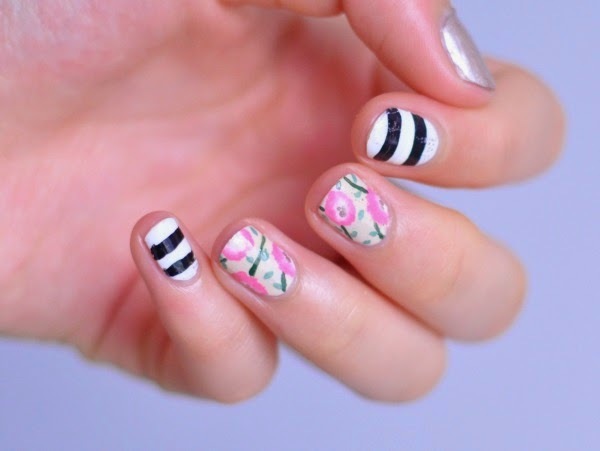 I've been feeling kind of uninspired recently, but checking on my favorite nail art blogs always helps! Lacqueerisa always does gorgeous designs, I really loved her "creamy dreamy floral" manicure from a few months back so I decided to recreate it. 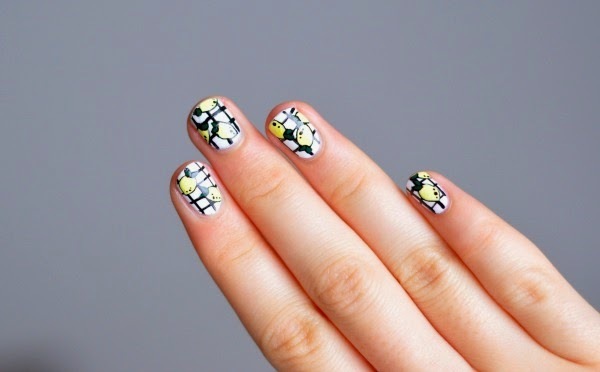 What are your favorite sources of nail art inspiration? I've been super busy recently. I've literally had a competition, conference, or audition every single weekend since January 1st! Until this week!! The entire eastern U.S. is kinda having a huge winter storm right now, and so we've had an entire week off from school. 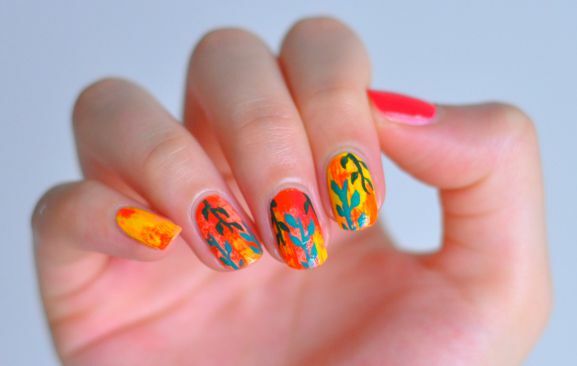 I've just been going on Tumblr and doing nail art all day! 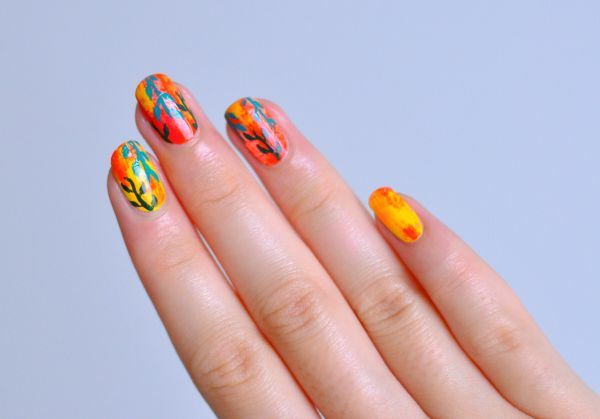 So Nailicious is this awesome site (with gorgeous photography!) that makes great tutorials for all skill levels. 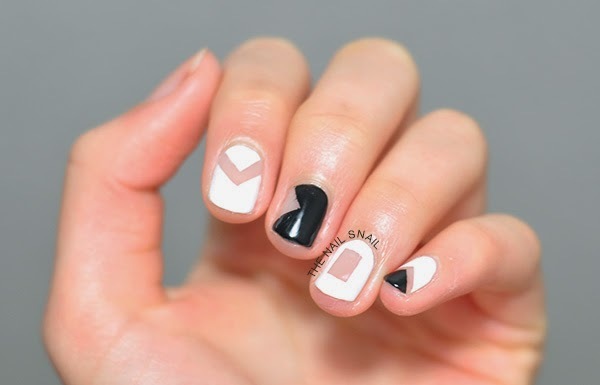 Their negative space tutorial has been on my to-try list forever. 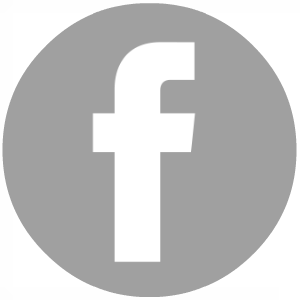 I love the negative space look, it's so clean and elegant (maybe that's why it's been so big on the runway recently). And ok this is a lil tangential, but can we just talk about white nail polish?! It's so often used and yet it's so!!difficult!! 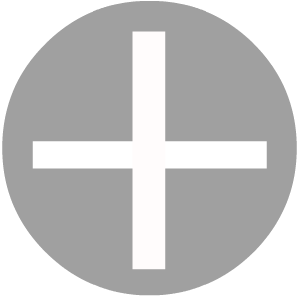 !to find a good white polish. I've tried pretty much every white polish under $5 (because I am cheap af) but they either require like 600 coats for opacity or they get gloopy after a few uses. I finally just gave up and got my friend to buy me Essie 'Blanc' for my birthday, but that's $8.50 she'll never get back..somebody hurry up and make a $2 decent white polish already!!! 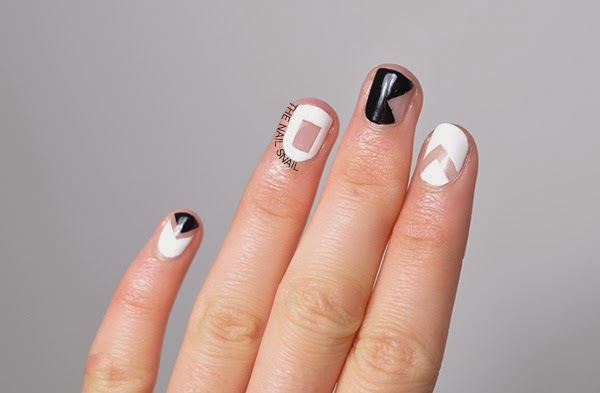 What's your go-to white polish? 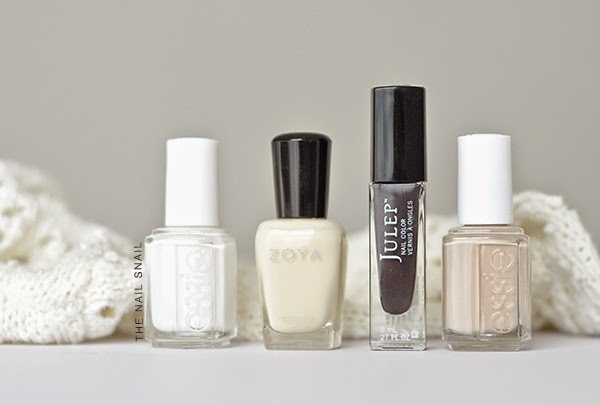 Today I have an updated nail care post combined with my favorite winter polishes! 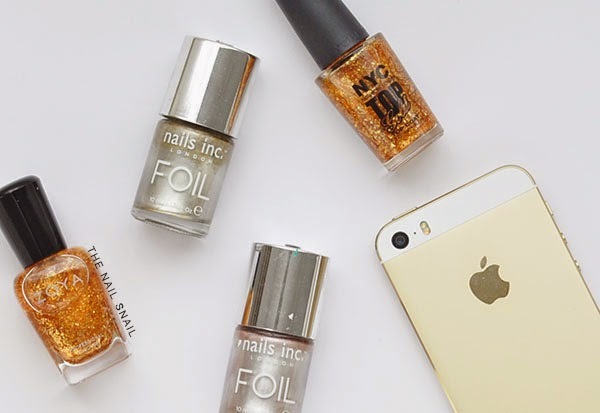 Here's how I keep my nails healthy! Frequent application of lotion and cuticle cream is essential! It keeps your skin nice and soft, and keeps your cuticles from cracking and peeling (and, heaven forbid, developing hangnails!). It's a little thick and greasy, but it works great, and smells so good! Also, a tin lasts forever -- I've had mine for over a year. My mom actually got this as a free sample when she bought cosmetics from Clinique, and I love it! It's really hydrating and it doesn't make your hands super greasy. I also like that it's unscented; I always feel self-conscious applying scented lotion in public because everyone seems to be able to smell it! I don't have a super elaborate ritual before I paint my nails, but there are a few things I always do for aesthetic and health reasons! First, I file my nails. If you use an emery board to do this, STOP!! Go invest in a glass file!! Glass files make your nails so much less likely to split. Also, they literally last forever so in the long run they're definitely cheaper! Then I push back my cuticles. 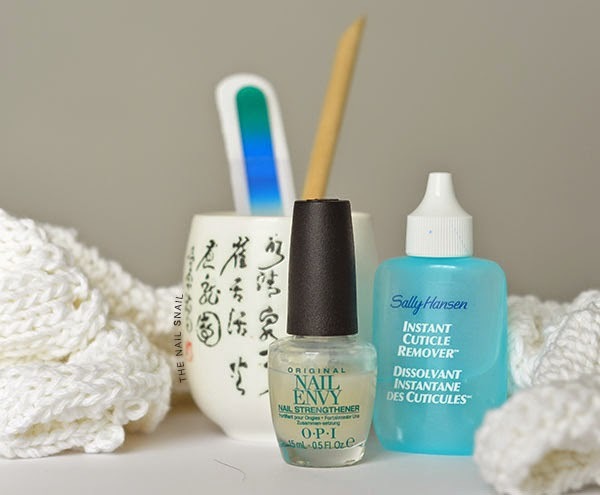 I always use Sally Hansen's Instant Cuticle Remover and an orangewood stick. Third, I moisturize my nails and cuticles with the Burt's Bees cuticle cream, and let that sink in for a few minutes before cleansing my nails with a Q-tip and some pure acetone. Lastly, I paint a coat of OPI Nail Envy. I swear by this stuff -- before I started using it, my nails were always chipping! 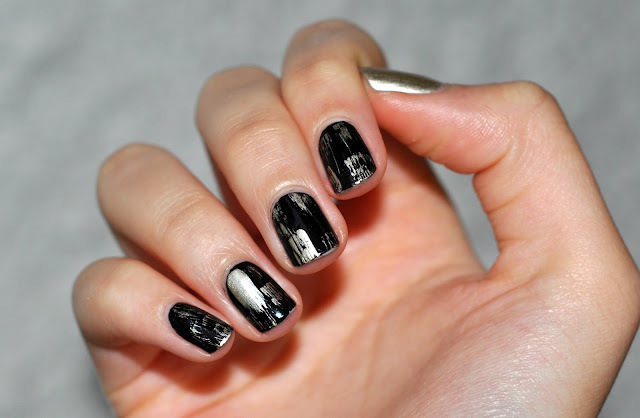 It makes your nails less brittle and thus less prone to breakage. It's costly, but so worth it! Neutrals match everything! They're so elegant and understated, but add so much class to your appearance :) White nails in particular look great with anything, at any time. Blues, while not as work-appropriate as neutrals, are usually great winter shades. I usually go for blue-toned true blues more than greenish blues during the winter; the colder colors seem more appropriate. Try a cobalt blue for a bright pop of color, or a darker navy for a more subdued look! Gold glitters and foil polishes are perfect for festive occasions during colder weather -- not too over-the-top but not too drab! Okay, that's 10 polishes, but top coats don't count, right?? You can never go wrong with matte topcoat, especially during the winter! The velvety-matte finish matches so perfectly with the grey skies and frosty ground. My favorite matte topcoat is JINsoon's Matte Maker, but the one from Revlon works really well too and is a whole lot cheaper! 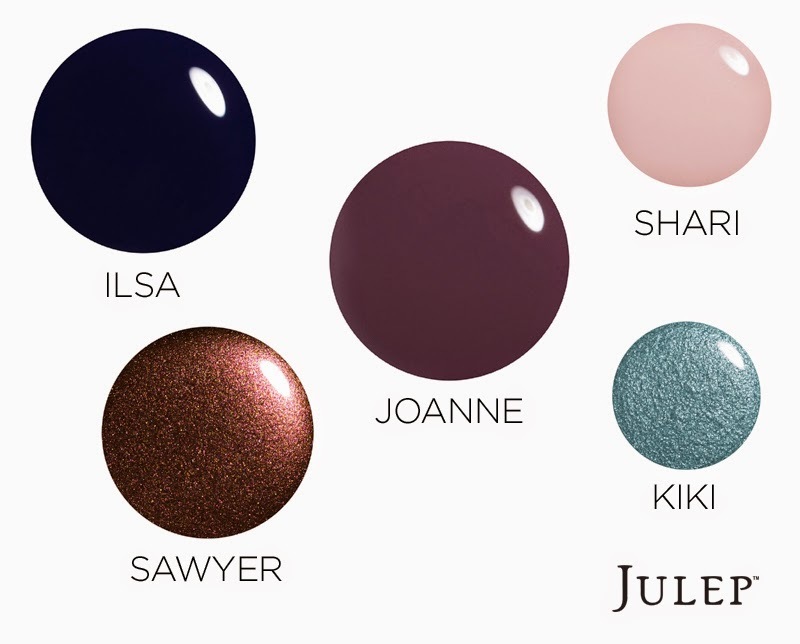 Here's a fun graphic of trending winter colors from Julep -- be sure to check out their nail polish color page! 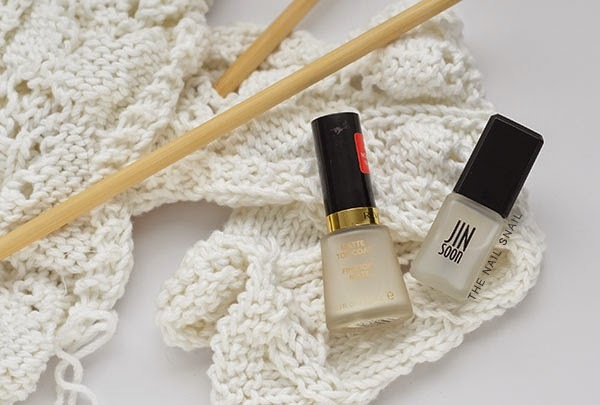 Hope that wasn't too long, and you got some helpful tips on winter nail care from me + Julep! 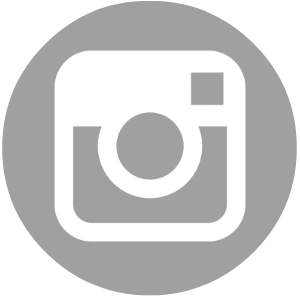 I really admire the nail artist Lady Crappo (Instagram | blog). She has perfectly shaped nails and does the most amazing unique designs! 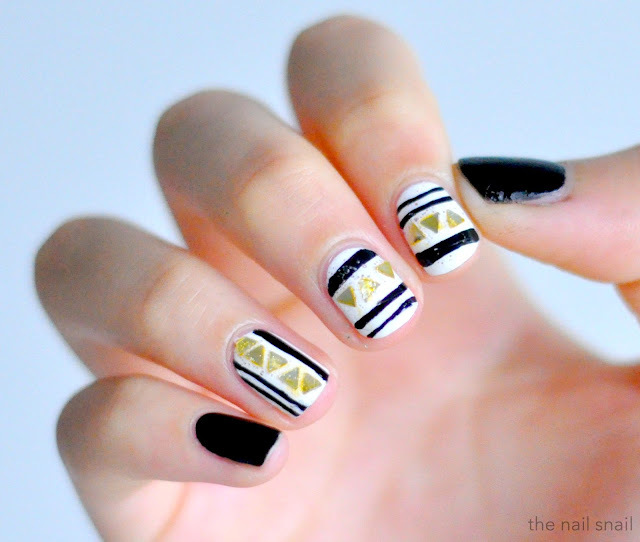 These were really simple to do, and I actually did them with my non-dominant hand. I just sponged on the gradient and then used a straw to create the gold splatter! I wasn't in love with how the splatter looked at first but it's grown on me over the past couple days. 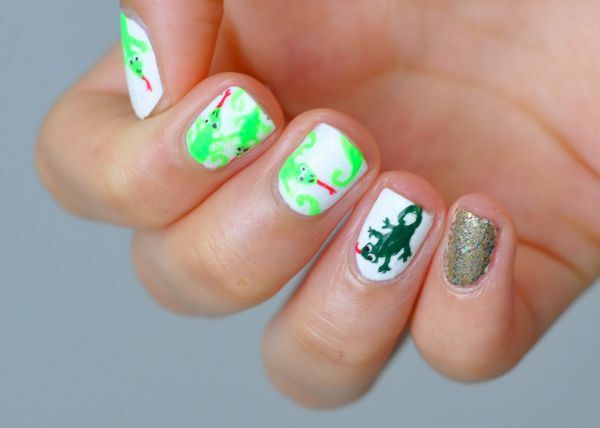 If you're not following Lady Crappo already, be sure to check her nails out!